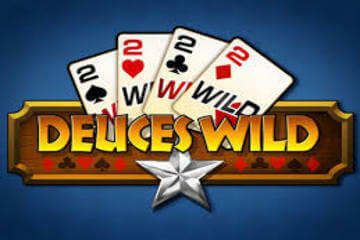 The deuces wild video poker game is one of the most popular in casinos around the world. It is almost as popular as the Jacks or Better game and you will often see them side by side in the best Vegas casinos. The Wild 2s are the key feature that makes this game unique and extremely enjoyable and addictive to play. Video poker branches out into several popular formats, and Deuces Wild is one of the most praised and loved among bettors online. This is a draw poker type of game that uses a single 52-card deck and its greatest advantage is that it gives the bettor higher chances of making a winning hand than a regular video poker gameplay mechanism. You could say that Deuces Wild is standard video poker with a twist. Learning to play Deuces Wild is plain sailing. Deuces Wild plays out just like any other video poker machine. The first thing a person needs to do is set the bet; choose the coin size and determine how many coins to wager. Click on the Deal button to have the software deal you with an initial hand of cards. Next, you are required to make a choice which cards are you willing to keep, and which can be removed. Depending on the developer, you might need to click on a Hold button above each card or simply click on the cards themselves to select the ones you wish to transfer into your final hand. Click on the Deal button again to have new cards introduced into your hand. It’s just once that you can discard cards and replace them. The second time you’re dealt with cards, those are the ones that form your final combination and the round is over. If you make a winning rank the machine will pay you a specific sum according to the strength of your hand. What makes Deuces Wild so compelling is the fact that all the four deuces in the deck act as Wilds. That makes them the best cards one can possibly get. In such conditions, the hand rankings are slightly different than in regular poker. Three of a Kind is the lowest hand qualifying for a payout; you need to get a pair and a deuce or three cards of the same value to receive a Three of a Kind payout. Natural Flush is worth the most, the one without deuces. What More is There to Know About Deuces Wild? Using Wild cards adds needed variation to the game, but some players prefer to play regular poker because Wild cards can downplay the skill element they rely on. Wilds can diminish the relevance of other cards and make the game all about replacing them. On the other hand, Wilds increase the frequency of good poker hands. When it comes to strategy, some of the recommendable moves include discarding a non-deuce card in a hand with 4 deuces, discarding one card that has been dealt with 2 deuces and 2 cards to a Straight or Royal Flush, to discard 3 other cards in a hand with 2 deuces, to keep all cards in a winning hand with one deuce and so on. In Deuces Wild Poker, players can also make use of the Gamble feature which allows them to double their win by playing a mini-game with five cards. One is dealt face-up, and the other four are dealt face-down. The player picks a card from the other four that needs to be higher than the one facing up for the gamble to be successful.